Samsung recently announced the Monte S520 Touchscreen right about the time the 2010 Mobile World Congress was starting and during the event, there were more Monte handsets unveiled. 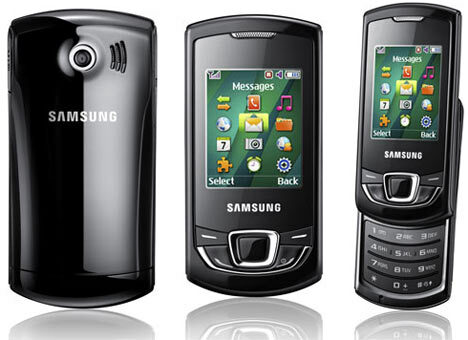 You now have the Samsung Monte Slider E2550 which as the name suggest carries the slider form factor. Then there's the candybar model called the Monte Bar C3200. While the touchscreen is something to drool over for an affordable feature-rich handset, the other two in the Monte line straddle the other extreme end of the feature spectrum as probably the most uninteresting pair of handsets ever made. They're neither a mini nor lite versions but are entirely in a different class, a lower class actually. One wonders why Samsung had to use the Monte name when their alphanumeric designations don't even jibe. We get the suspicion Samsung just wants the splendid aura of the Monte S5620 to rub off on its immensely inferior slider and candybar siblings. But without a doubt, this is a capable utilitarian handset that we can suspect Samsung could offer as the cheapest handset on the planet. That's about the only way it would have any kind of value for its target markets. The Monte Slider is a very basic 2G mobile phone on the dual band GMS/GPRS (900/1800). That means it can't get radio telephony coverage in many parts of the planet. It sports a slider form factor body that measures 98.5 x 48.5 x 14.4 mm and weighs in at a mere 85.5 g giving it some claim to be among the lightest slider phones in the market. Its local data connectivity features include Bluetooth 2.1 with A2DP and microUSB 2.0 for wireless and wired data transfer needs. There's no SatNav feature to talk about. It sports a rudimentary 1.3 megapixel camera that Samsung must have cannibalized from 5-7 year old unsold camera phones. It has the features of one too like fixed focusing and 15fps QCIF video recording. Your photos taken with it would display nicely on a matching 2-inch TFT LCD QVGA display with 256k colors. No matter how basic, no handset can appeal to any market segment without some entertainment feature and here, the Monte Slider actually shines with DNSe (Dynamic natural Sound engine) also found on the better Samsung phones as it brings the listening experience to a higher plain with stereo widening and surround simulation. Apart form the capable media players for popular audio and video files, it has stereo FM radio with RDS and broadcast FM recording. There's also a speaker phone but no 3.5mm headphone jack. You do get Bluetooth A2DP for wireless stereo listening. Until we read its specs, we could have sworn 12 MB phone memories are a 20th century artifact. But the Monte Slider surprised us here. But you still get a phonebook that supports up to 1,000 entries with photocall and a microSD expansion slot for up to 8 GB. With a minimal feature set, it's no wonder that its 800 mAh Li-Ion battery can deliver up to 6.6 hours of talk time and 16 days of standby time when charged to the max. Software-wise, the Samsung Monte Slider E2550 claims to be a socially aware handset with social networking apps that allow live updates to your social network sites like Facebook. You also get WAP 2.0 xHTML web browser for surfing though it is doubtful anyone would be surfing on it with a 2-inch screen and slow GPRS speeds.